With the start of the new year, we wanted to take stock of the regrets we have about the city or our roles within it, and the resolutions we might make to change this place for the better. We want to ask two questions: What are the things that we know we should be doing, or wished we would do, or find ourselves scared to do, but never get around to actually doing? How can we take responsibility or ownership over our actions, or lack thereof, and find a way to be honest with where we should go next? We’re wondering what citizenship looks like in a city like Windsor, and how we might be able to publicly and honestly articulate it. 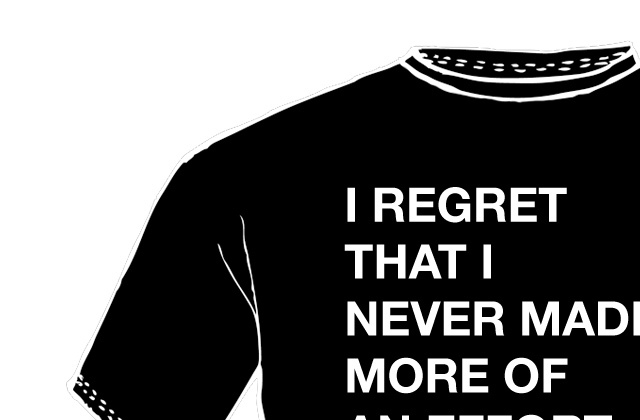 Regret & Resolve is a new project where we’ll be turning a series of resolutions and regrets into t-shirts. We’ll take online submissions from residents of Windsor and create a limited edition series of 50 shirts. Each selected submission will be made into two shirts — one for the author and one for our gallery exhibition. We’ll release all the shirts on the same night (January 31st) with an exhibition and exchange at Civic Space that will be open to the public. We want these shirts to capture a moment of tension and hope in the city as we know it today and hope for it to be tomorrow. We feel like there may not be a venue to collectively articulate the responsibilities shared across this city, and that a t-shirt might be a good place to start. Printing these regrets and resolutions on t-shirts allows for a distributed conversation, a series of positions that we might take at the beginning of a new year, and a way to publicly talk about what we’ll do next. We’re really interested in an honest assessment of the things gone wrong, and the ways in which we might commit to righting them. Interested? Fill out an online form between January 7-25, 2013 with your statement of regret or resolution. We’ll select 50 submissions and print them for the opening at Civic Space on January 31st from 7-9pm. Submissions are now closed, see you on January 31 at 7pm!